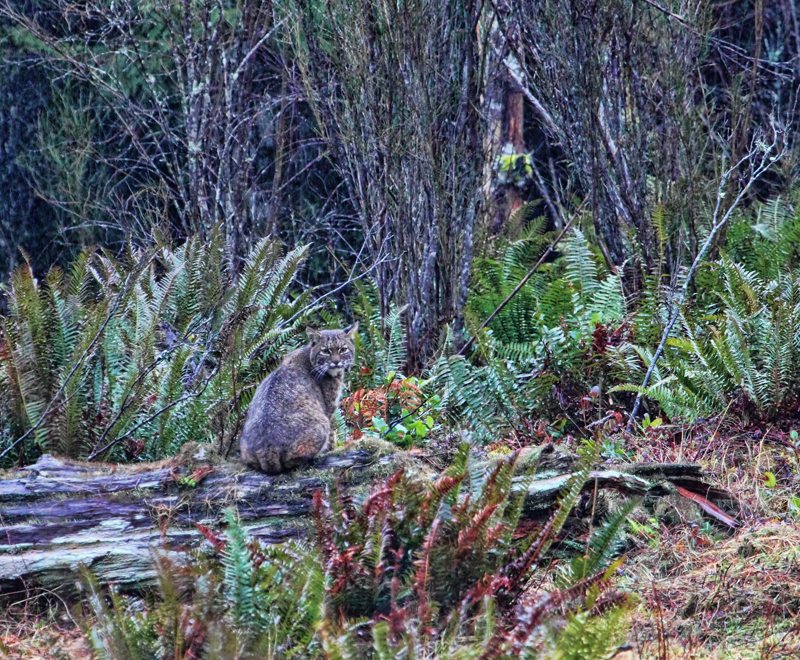 Peggy Collins Photography: My First Bobcat Pictures! So as I mentioned in a recent post, I saw my first wolf and my first bobcat within an hour of each other last week. My husband tried to convince me that since it was the day after Valentine's, he'd arranged it all as a gift. We were walking the dogs back to the van half an hour after seeing the wolf and I realized that the reason a big group of ravens was hanging around going kind of crazy (flying around and calling out) was because of a dead elk. Since the wolf had been walking in the direction of the elk carcass, I figured he might be heading that way for a meal. So we took the dogs home and I returned in my van, ready for action. I parked my van on the trail and felt safe enough because there was at least 100 feet of dense bush between me and the elk. The only problem was, I couldn't get a clear shot over the bushes so I opened my van door and stood on the chassis, propped my foot on the open door, and had a look through my lens. That's when I realized there was a bobcat there! I've never seen one before but they're pretty recognizable. After half an hour or so I saw the bobcat looking up into the woods nearby and lo and behold, another much bigger bobcat shows up! 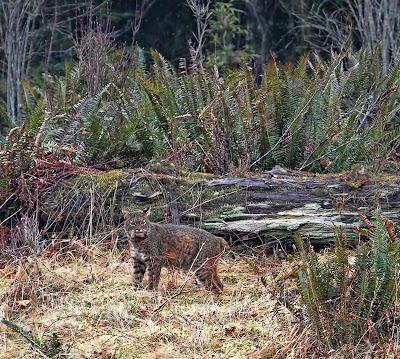 I later Googled for information about bobcats...I figure the second cat on the scene was the mother because they usually stay with their young until the following spring when the bobcats go their separate ways. Mom's stomach was already pretty huge from eating but she helped herself to more. 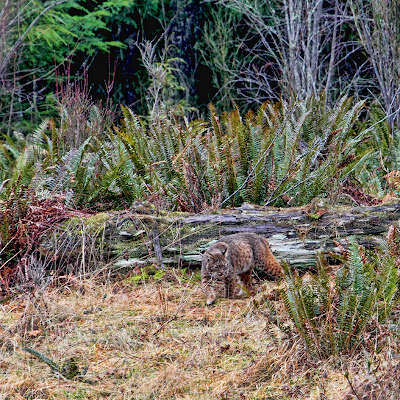 I won't show you the pictures of the younger bobcat or the two of them together because a) they're kind of gross with the elk carcass there and b) both cats were behind bushes so the shots aren't at all good. I was having a hard enough time getting clear shots anyway because of my precarious position standing on the chassis and the weather was getting increasingly dismal. Anyway, eventually the younger bobcat wandered off into the nearby forest. After eating for awhile, mom started marking her territory by pawing at the ground continually. She sent the turf flying time and time again and kept it up for about 20 minutes before disappearing into the woods. Here's a shot I got of her before she disappeared though. 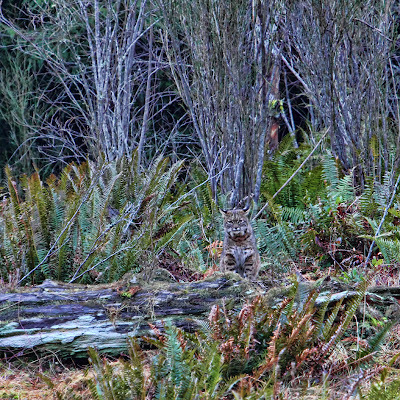 I waited around for about an hour but neither bobcat returned so I went home to grab some lunch. I drove back an hour later and found a slightly better spot to park. I had a look through my lens and didn't see anything so I walked around a bit, making sure that I wasn't missing any choice locations to shoot from. When I returned to my van I had another look and realized a bobcat was there and most likely had been there all along. They're very well-camouflaged, in case you didn't notice! 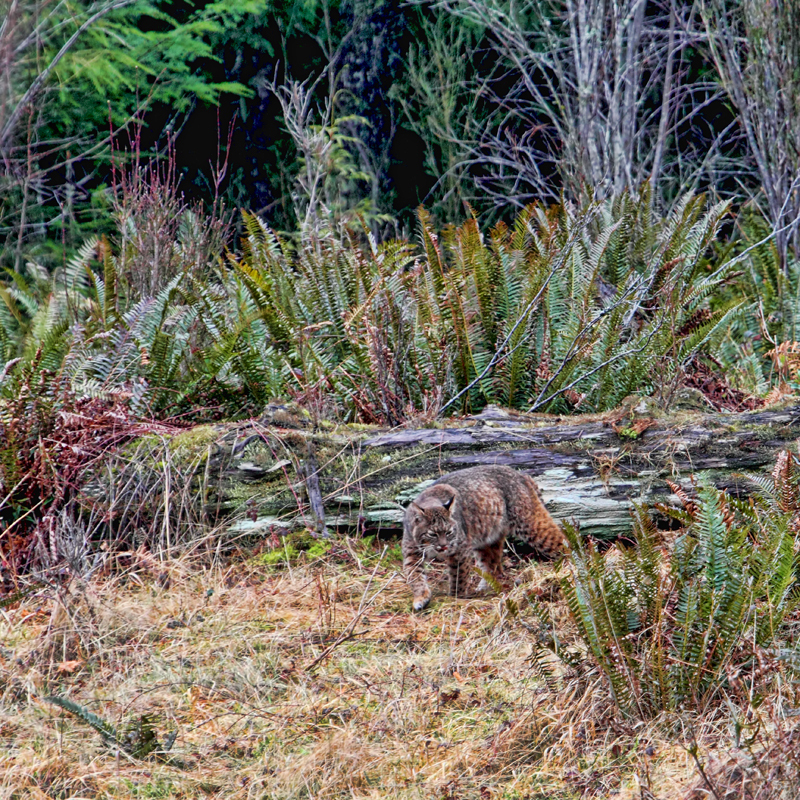 This time the bobcat didn't seem to be interested in eating at all, only in pawing at the ground, marking her territory. Once in awhile she'd look directly at me. Overall, though, she didn't seem the least concerned with my presence. In fact, I'd noticed as I drove up to the spot that one of my wheels was making an incredibly loud racket...I think there was a rock caught somewhere. In any case, it didn't seem to bother the bobcat in the least. 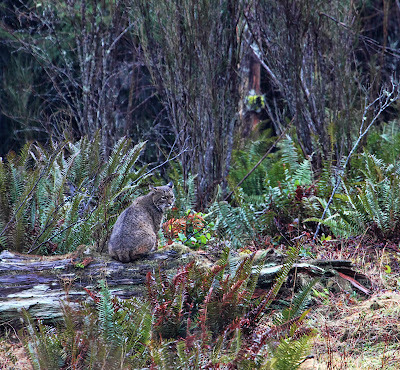 Eventually the bobcat was satisfied that she'd marked her territory. She climbed up onto a log and struck a pose. Then she trotted off into the woods very casually but not before gazing at me for a few seconds from behind a bush. I waited an hour or so but she never reappeared. All in all I'd had at least an hour's time in the company of bobcats. The next day I was back, bright and early. Well, I shouldn't say "bright" because it was raining. To my complete shock, I saw that the entire elk had been devoured down to the ribs, which had been dragged about 25 feet away from where the body had been the day before. I think I can make a pretty safe assumption that a wolf pack had feasted on the elk overnight. It was raining pretty steadily by that time. 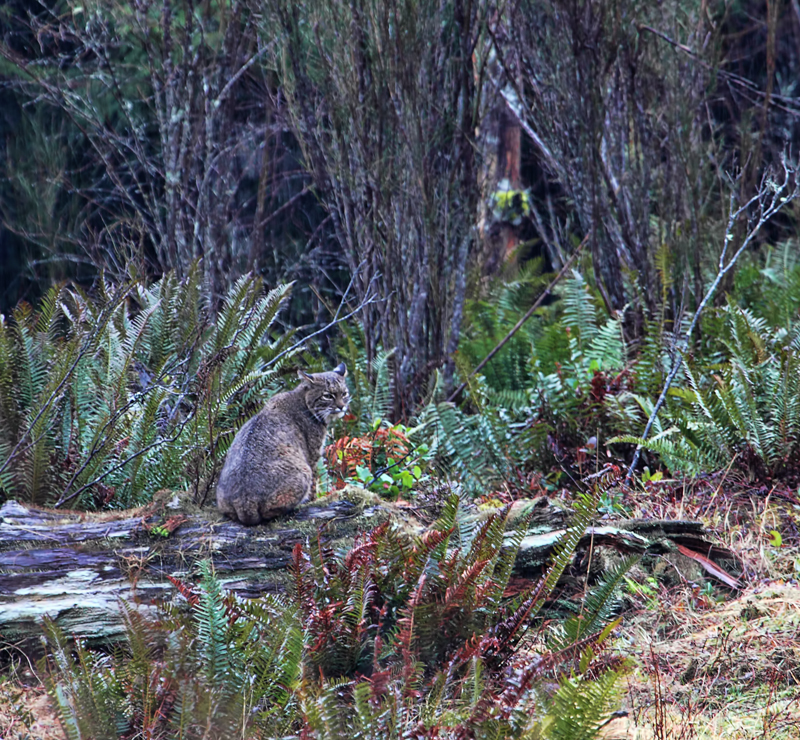 To my surprise, the bobcat climbed onto the fallen log and sat there for about five minutes in the falling rain. And I thought cats hated the rain! Here she is apparently making sure that I was suitably impressed by her beauty. I was! Eventually she climbed down from the log and gave me one last look before leaving. I again waited for at least an hour for her to return but she was a no-show. There was no food left, so no reason for her to come back, I suppose. But I kept hoping. Because you know what? Watching bobcats is kind of addictive! 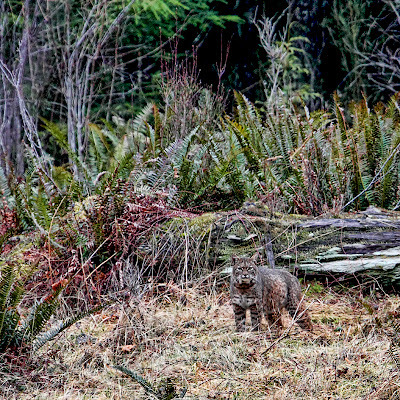 Labels: "bobcat pictures" "bobcat photos" bobcats "bobcat animal" "pictures of bobcats" "picture of bobcat" "photo of bobcat" "photos of bobcats" "wild animal pictures"
Oh my gosh!!! She was sure not lacking for food!! What an amazing experience this had to be!! I can't imagine!! Awesome experience and pictures! Thanks for sharing this! Amazing, Peggy!! What a thrilling and memorable experience! So happy to be able to share your adventures here on your blog. Thanks very much, Debbie, SuevianArts, and Georgianna! It was definitely a memorable experience and one I've replayed many times now. I'm wondering if the bigger bobcat wasn't just fat from eating...she might be pregnant. According to Wikipedia, bobcats mate in February or March and have their young in April or May. Anyway, she was certainly fat enough! amazing story and pictures! I must admit I am jealous! 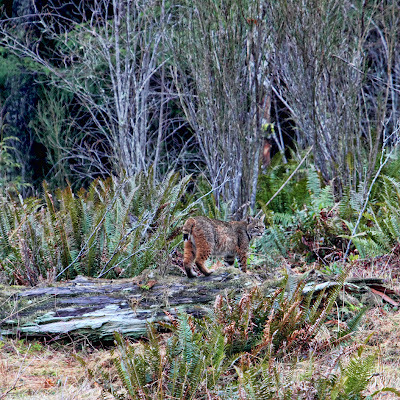 The only bobcat I have seen in the wild ran across the road in front of me while I was driving. No time to take a picture of that! Beautiful!!! 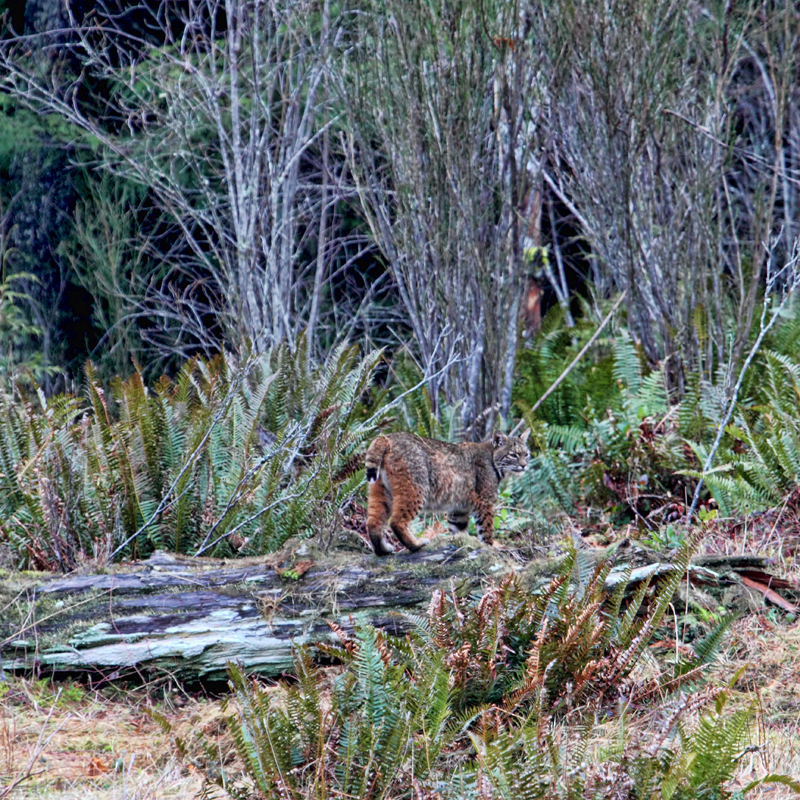 I have to admit, I was a little jealous of my husband because he'd seen a bobcat twice before. 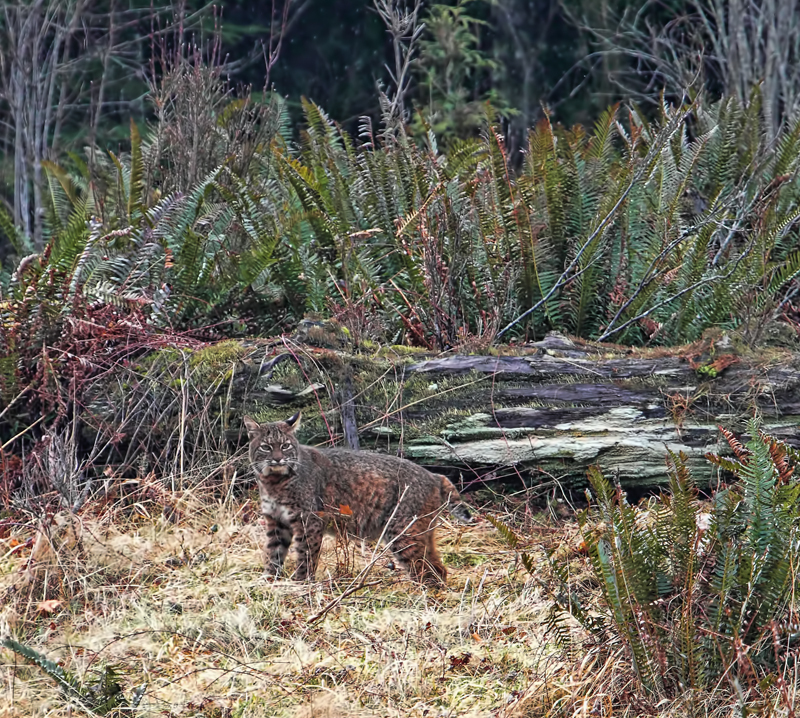 A bobcat ran across the highway in front of him just a couple of weeks before my sighting. I agree, it's hard to take a picture under those circumstances!